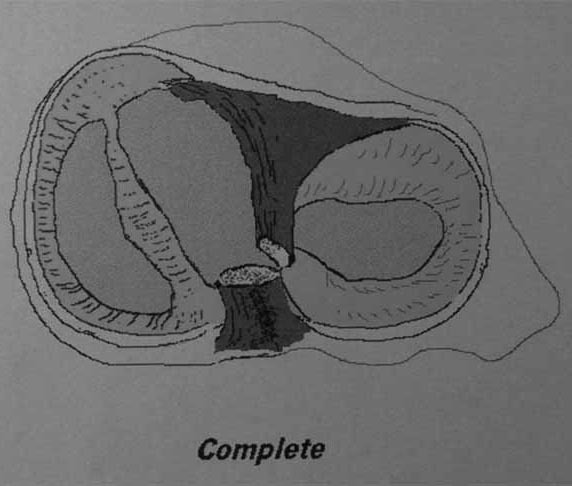 Pathology: Bucket handle tear represents a long-axis longitudinal tear of the meniscus (bucket), and displacement of the attached inner fragment (handle). 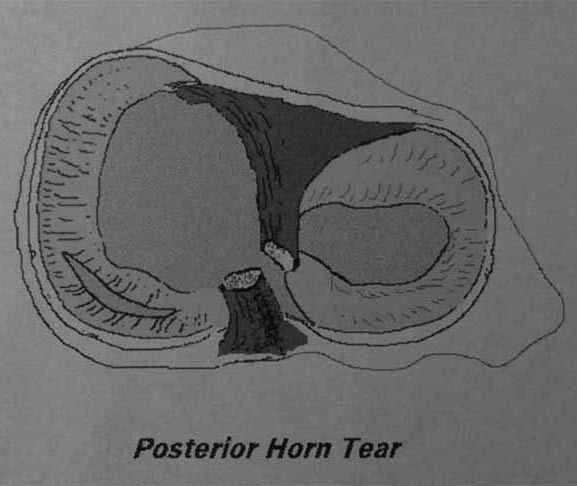 Commonly, these tears involve the medial meniscus, begin with a vertical or oblique posterior horn tear, and propagate anteriorly and longitudinally. 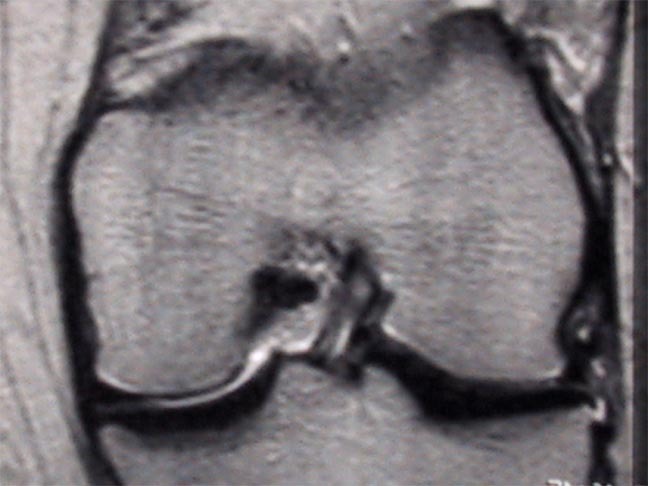 10% of meniscal tears are of a bucket handle configuration. 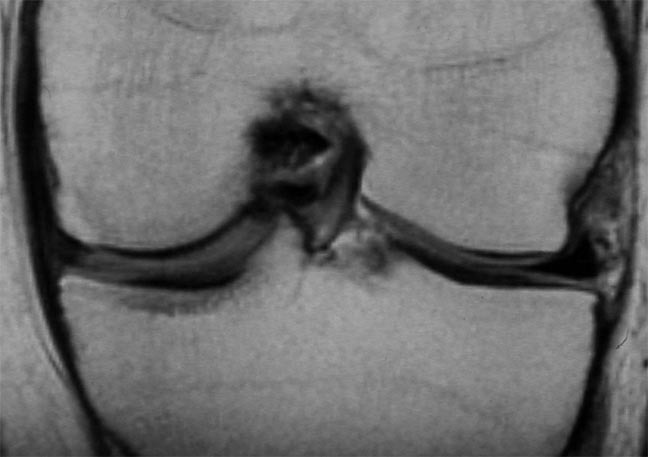 Imaging findings: Frequently, disruption of the normal Bow-tie sign configuration of the peripheral meniscus is noted (sagittal view). Pitfalls: In addition, potential pitfalls which may be confused with meniscal tears are discussed. 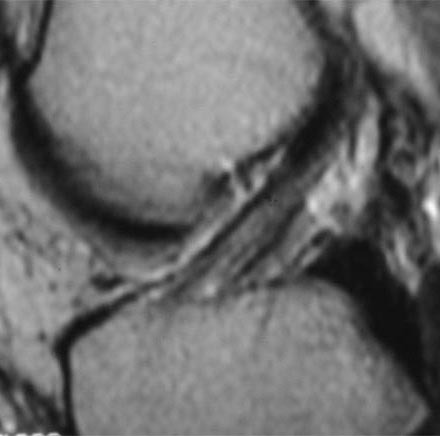 Multiple sagittal T1 weighted images reveal loss of the normal bow-tie appearance of the meniscus (black arrow). The "absent bow tie sign" is another good sign of a bucket handle tear of the meniscus. The absence of the normal bow-tie is secondary to the displaced fragment which makes up the "handle" of the bucket. 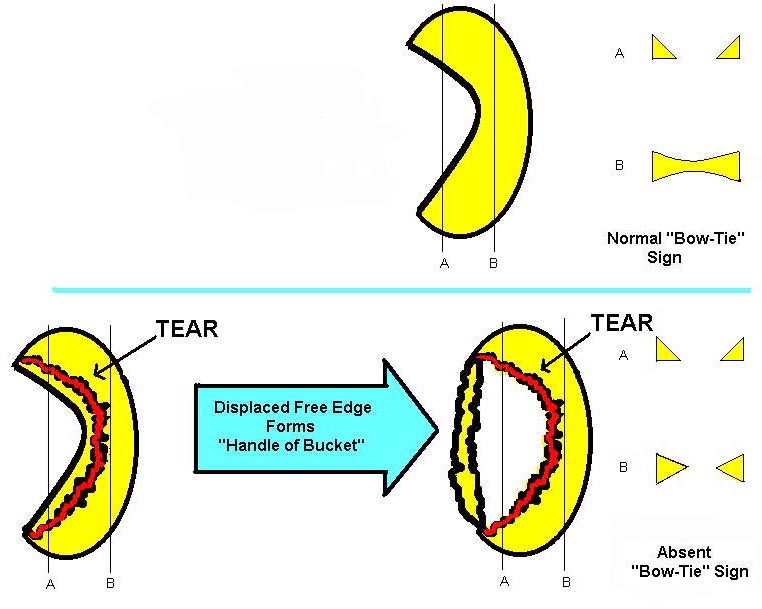 Requirement for the absent bow tie sign mandates that the normal requirement of at least two adjacent sagittal images with a normal meniscal body segment appearance is not present. Pathology: Inner fragment of torn meniscus is flipped over ipsilateral anterior horn, and lies superior or posterior to the normal anterior horn. 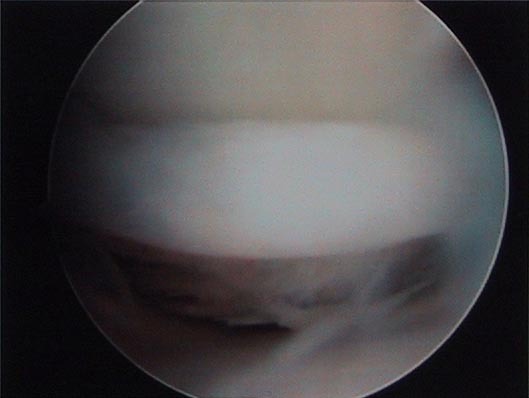 Occurs more frequently with medial, rather than lateral, meniscal tears. Imaging findings: Abnormally large anterior meniscus (8+ mm), measured in vertical dimension, with a diminutive posterior horn (sagittal view). 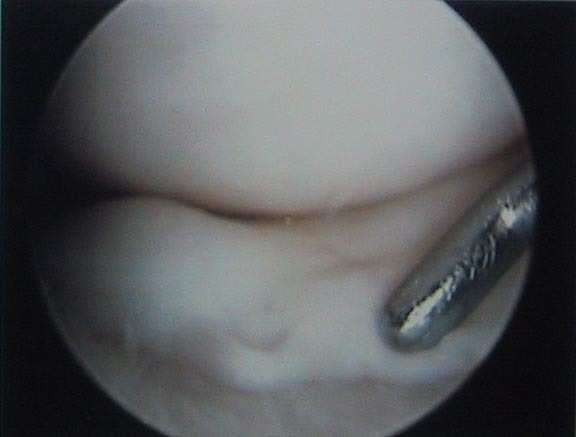 Alternatively, anterior lying fragment results in elongated anterior horn with a band of high signal intensity differentiating the anterior horn from the immediately adjacent (anterior or posterior) flipped meniscal fragment. 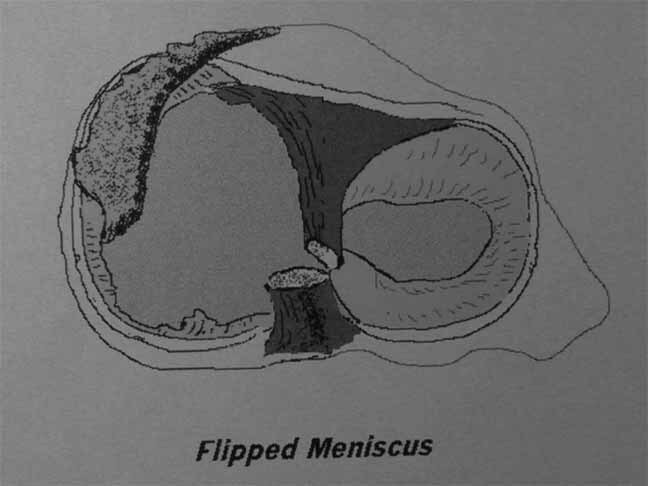 Note: The flipped meniscus is frequently associated with concurrent fragment-in-notch meniscal displacement. 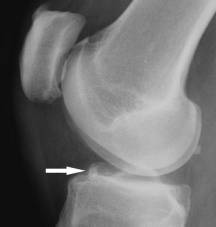 Pathology: Meniscal bucket handle tear, with meniscal fragment displaced within the intercondylar notch. 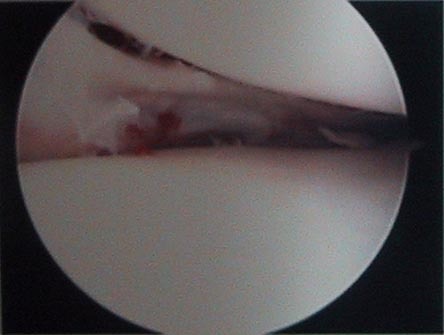 Occurs more frequently with medial, rather than lateral, meniscal tears. Imaging findings: Band of low signal intensity within the intercondylar notch (coronal and sagittal views). Note: Unlike the double PCL sign, the displaced fragment is not within the same sagittal plane as the PCL. Pathology: Meniscal bucket handle tear, with inner meniscal fragment displaced into the intercondylar notch, anterior to the PCL. 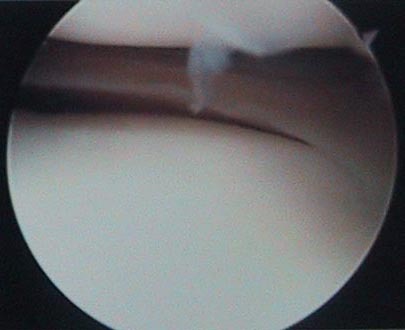 Double PCL sign occurs with medial meniscal tears only; the ACL prevents displacement of lateral meniscal fragments into the intercondylar notch, anterior to the PCL. Imaging findings: Band of low signal intensity, anterior and parallel to the PCL, simulating the PCL (sagittal view). 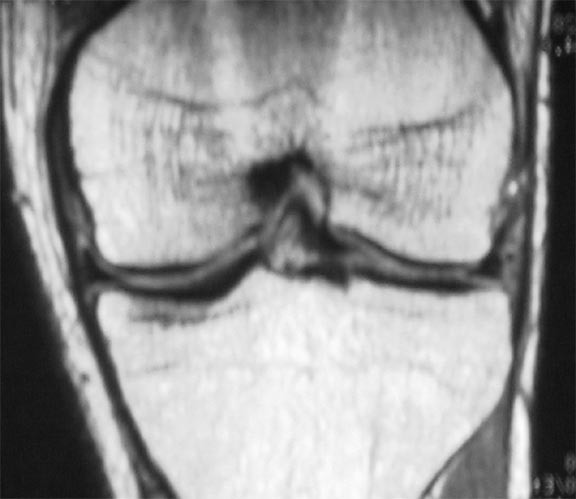 Band of low signal intensity within the intercondylar notch, between the PCL and tibial plateau; associated truncation of triangular configuration of peripheral meniscus (coronal view). Note: The double PCL sign tear may be considered as a subset of fragment-in-notch type medial meniscal tears, in which the displaced fragment lies in the same sagittal plane as the PCL. 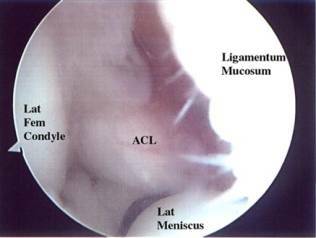 Pathology: Meniscal bucket handle tear, with inner meniscal fragment displaced into the intercondylar notch, anterior and lateral to the ACL. Double ACL sign commonly occurs with lateral meniscal bucket handle tears. Imaging findings: Band of low signal intensity, anterior and lateral to the ACL (sagittal view). 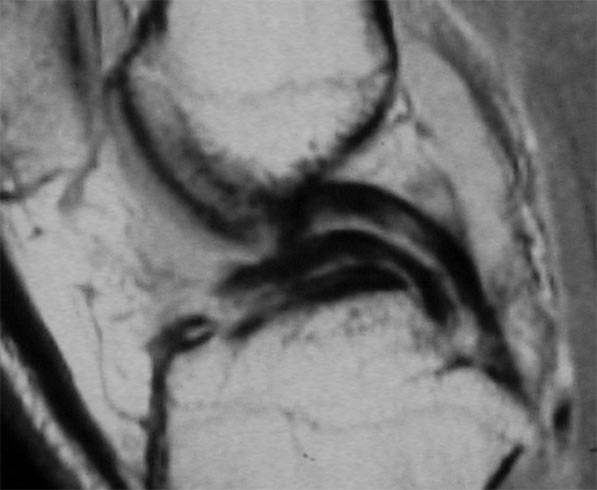 Because of the oblique orientation of the ACL, the meniscal fragment may parallel and simulate the ACL when viewed on oblique sagittal orientation. 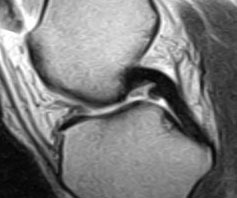 Band of low signal intensity may be seen within the intercondylar notch, parallel to the ACL; associated truncation of triangular configuration of peripheral meniscus (coronal view). 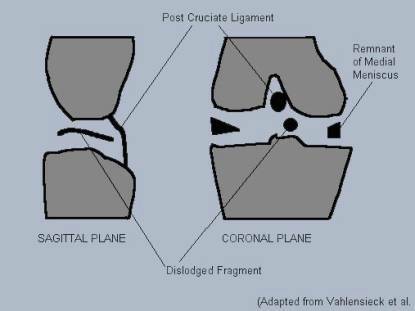 Note: The double ACL sign tear may be considered as a subset of fragment-in-notch type meniscal tears, in which the displaced fragment lies in the same sagittal plane as the PCL. Gentili A, Seeger L, et al. 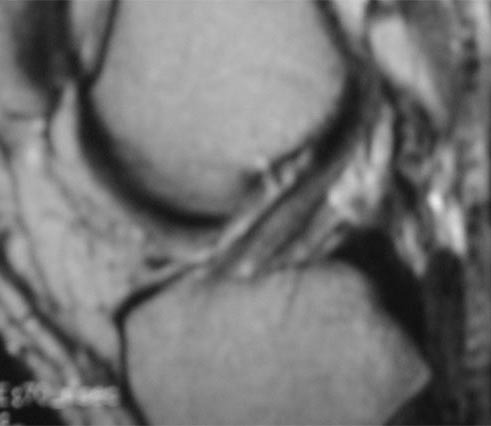 Anterior cruciate ligament tear: indirect signs at MR imaging. Radiology 1994;193:835-840. Helms CA, Laorr A, Cannon WD. The absent bow tie sign in bucket-handle tears of the menisci in the knee. AJR 1998;170(1):57-61. Mesgarzadeh M, Moyer R, et al. 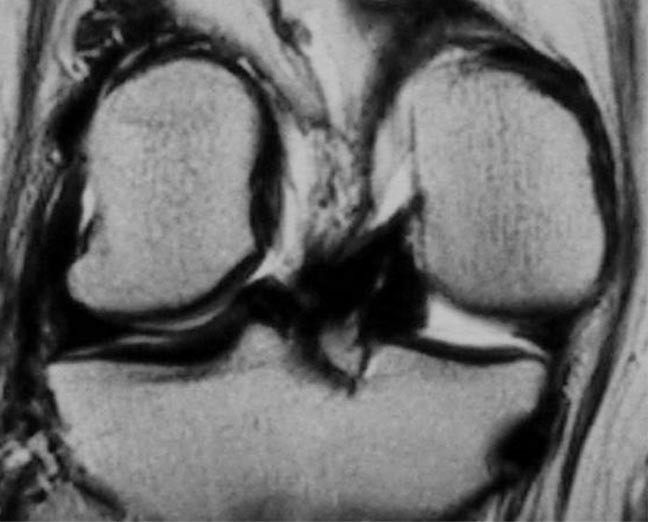 MR imaging of the knee: expanded classification and pitfalls to interpretation of meniscal tears. 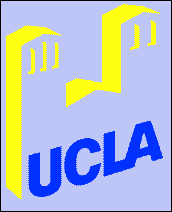 RadioGraphics 1993;13:489-500. Murata Y, Yoshida D, et al. 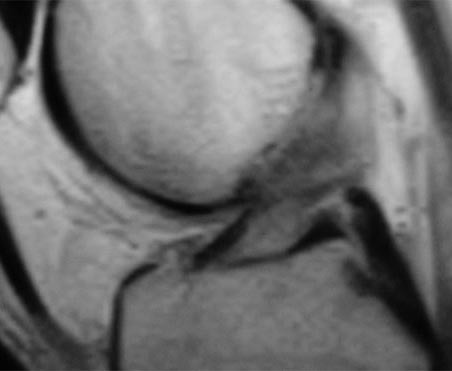 MRI of meniscal bucket handle tear: the double PCL versus the double ACL. Abstract ECR 2000 meeting. Ruff C, Weingardt JP, et al. 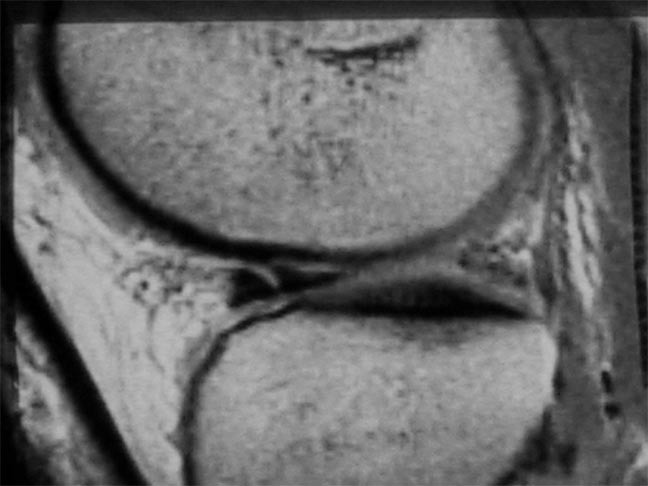 MR imaging patterns of displaced meniscus injuries of the knee. AJR 1998;170(1):63-7. Singson RD, Feldman F, et al. 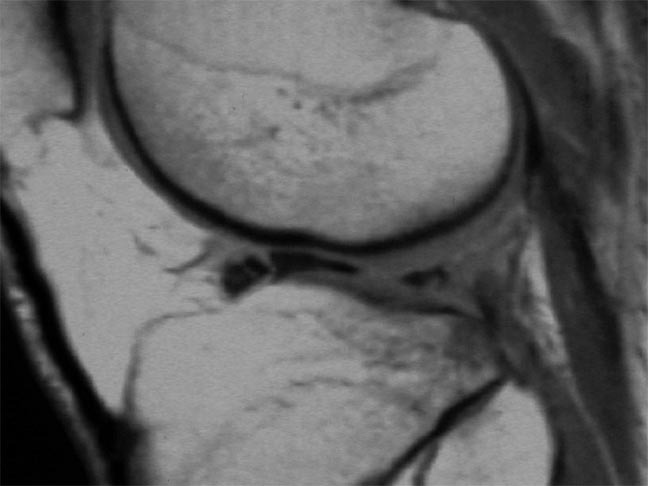 MR imaging of displaced bucket-handle tear of the medial meniscus. AJR 1991;156(1):121-4. Sparacia G, LoCasto A, et al. 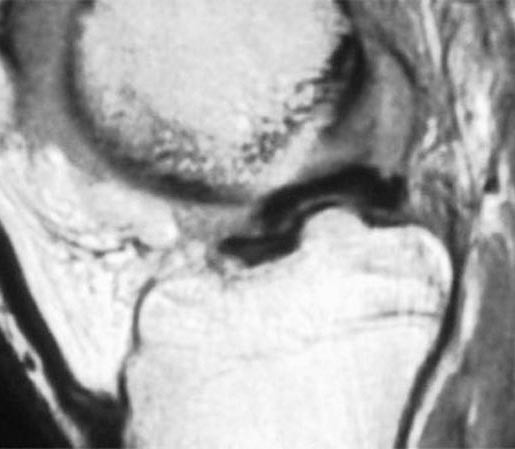 Bucket-handle tears of the knee menisci: pitfall in interpretation at MR imaging. RSNA presentation/paper 1997. 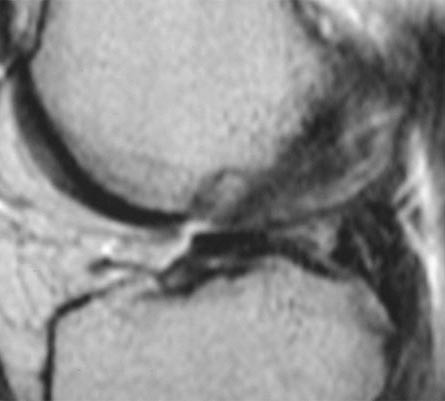 Weiss K, Morehouse H, Levy M. Sagittal MR images of the knee; a low signal band parallel to the posterior cruciate ligament caused by a displaced bucket handle tear. AJR 1991;156:117-199. 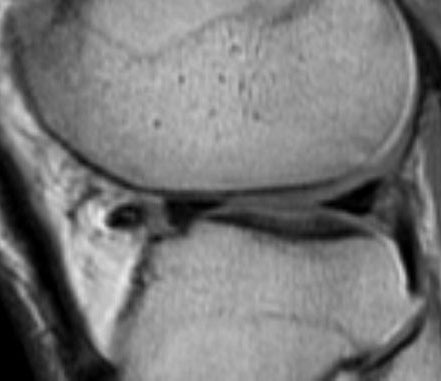 Wright DH, De Smet AA, Norris M. Bucket-handle tears of the medial and lateral menisci of the knee: value of MR Imaging in detecting displaced fragments. AJR 1995;165:621-5. Vahlensieck M, Genant H, Reiser M. MRI of the musculoskeletal system. 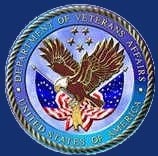 Injury 2002;33(2):191.